"Time and the world do not stand still. Change is the law of life. And those who look only to the past or the present are certain to miss the future." The United States is motivated to gain strong alliances with countries in the Association of South-East Asian Nations (ASEAN). It is apparent that political influence and economic power lies in Asia not in Europe or the Middle East. American political and business leaders recognize the importance of cementing ties within the Asean region as well as between the Asean countries and the United States. The Asean body consists of 10 members: Brunei Darussalam, Cambodia, Indonesia, Laos, Malaysia, Myanmar, Philippines, Singapore, Thailand and VietNam. The Asean head of state annual meeting, summit will be held on November 17-19, 2011 in Bali, Indonesia followed by the East Asia Summit (EAS) also in Bali. 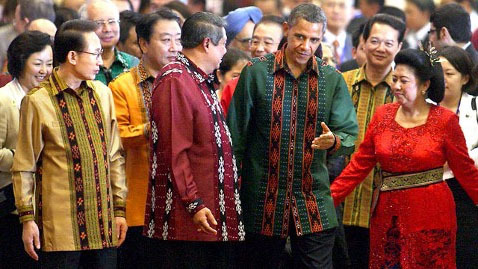 President Barack Obama attended the East Asia Summit. The United States is joining EAS in 2011. The EAS was established six years ago as a diplomatic arm of ASEAN, and includes other countries, such as Australia, China and India that have interests in the Asia-Pacific. It is critical for America to joint EAS in order for America to have a significant role in shaping the future of the territory as the world’s high growth region. The ASEAN region constitutes the fourth-largest overseas market for the United States. The United States has appointed a special envoy to ASEAN, located in Jakarta. America has signed the ASEAN Treaty of Amity and Co-operation, and been involved in the ASEAN Regional Forum. The United States has close ties with Thailand, the Philippines and Singapore that are treaty allies. Recently, the U.S. has attempted to improve relationships with countries with which it has had conflict. The U.S. is connected with Indonesia, the most populous Muslim country. The U.S. is attempting political and business reconciliation with Vietnam and even with Myanmar. ASEAN countries desire closer ties with the U.S., possibly as a shield against Chinese regional power. There have been recent disputes between China and Asean countries involving rights to the South China Sea, including Vietnam and the Philippines. There are concerns involving ownership of natural resources and shipping routes. Equilibrium of power is sought among countries, including the U.S., Japan, Australia, India and Russia in conjunction with the influence of China. The key issue involves the prospect of establishing a U.S.-ASEAN free-trade agreement. Our newsletters do not constitute business advice or opinions. Business questions may be complicated and an experienced advisor should be consulted in connection with particular cases. Advice should be given relative to specific facts and conditions.